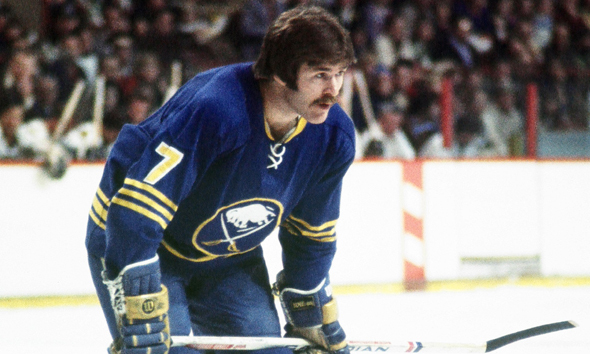 The 23rd-seeded ’79-’80 Buffalo Sabres continue to roll. Meanwhile, the New Jersey Devils franchise has yet to win a series after having a First Round bye in both tournaments. It was a tough four games for the Devils. They only scored eight total goals while allowing 18 and they only averaged 23.8 shots on goal per game while allowing an average of 35.8 shots per game. Patrik Elias, Randy McKay and Petr Sykora all scored two goals to co-lead the Devils. Meanwhile, defenseman Scott Stevens and Jason Arnott were the only other players to score for New Jersey. Scott Gomez led them in assists with three while Elias and defenseman Brian Rafalski were tied for second with two. Elias then led them in overall scoring with his four points while Gomez and Sykora were tied for second with three. The Devils did have three players finish with a positive plus/minus rating with defenseman Colin White at +2 and fellow defensemen Ken Daneyko and Rafalski at +1. Goaltender Martin Brodeur was not his usual self in this series. He posted a .888 save percentage to go along with a 4.00 goals against average. For the Sabres, it was just business as usual, but their offense was slowed down a bit by the Devils. After scoring 24 goals in their sweep in the First Round, they only scored 16 times here in the Second Round. Danny Gare led them offensively in this series and led them in goals with five. Rick Martin was second with three goals, two of which were game-winners, including the overtime winner in Game 4. There was a three-way tie for the team lead in assists at five between Gare, Gilbert Perreault and defenseman John Van Boxmeer. Gare finished with 10 points to lead the Sabres in overall scoring while Perreault’s seven were good for second. Defenseman Jim Schoenfeld posted a team-high +7 plus/minus rating while Perreault was second with a +6 rating. Goaltender Don Edwards was not very busy this series, but was solid in net as usual for Buffalo. He posted a 2.00 goals against average and a .915 save percentage in the four games. The ’79-’80 Buffalo Sabres continue to win and win easily. After making it from the First Round to the Semifinal last year, they have now advanced from the First and Second Rounds this year. Meanwhile, in their first UNP appearance, the ’00-’01 Devils are swept in the Second Round. The Devils franchise has now lost in the Second Round in both UNP’s while having First Round byes in both tourneys. The ’79-’80 Sabres now advance to the Third Round and they will face either the 7th-seeded ’71-’72 New York Rangers or the 26th-seeded ’05-’06 Ottawa Senators! Up next in the Second Round are the 16th-seeded ’02-’03 Dallas Stars and last year’s runners up, the 17th-seeded ’88-’89 Calgary Flames! This entry was posted in 1st Round, Ultimate NHL Playoff and tagged Brian Rafalski, Buffalo Sabres, Colin White, Craig Ramsay, Danny Gare, Derek Smith, Don Edwards, First Round, Gilbert Perreault, Jason Arnott, Jim Schoenfeld, John Van Boxmeer, Ken Daneyko, Martin Brodeur, New Jersey Devils, Patrik Elias, Petr Sykora, Randy McKay, Rick Martin, Scott Gomez, Scott Stevens, Ultimate NHL Playoff. Bookmark the permalink.